Are you an avid Association Football fan? Did you catch the UEFA Euro Cup in July? Well it’s time to get pumped for the next Battle Pet! 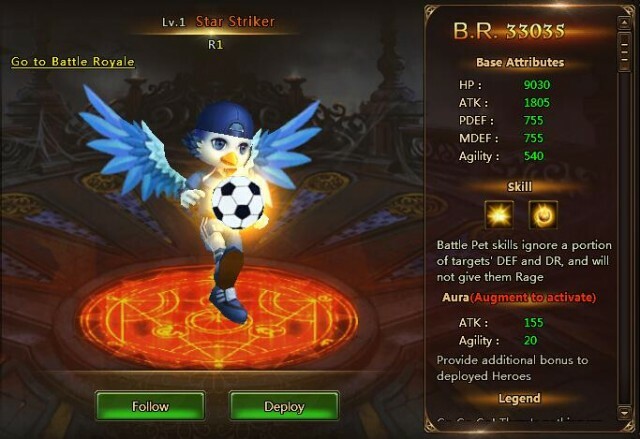 The popular free to play browser MMORPG League of Angels II is excited to unveil Star Striker! Straight from the pitch, this winged footballer from a mystic land of champions has a kick that will have your enemies diving for cover. Diehard football fans should recognize who Star Striker pays homage to. Here’s a hint: He is a retired player that once played for the nation that placed 2nd in the recent UEFA Euro Cup, and they share the same jersey number. That’s right, it’s the one and only Zinedine Zidane! Fans of the famous French footballer definitely should not miss the chance to recruit Star Striker for their squad. As a Striker, this winged champion is all about powerful and precise shots that can hit any target. With Volley Shot, Star Striker deals heavy damage against three enemies. With Precision Shot, he fires off a shot with such velocity that even enemies around the target will take great damage! At the same time, this skill will also buff the Hit rate of your strongest hero by a staggering 50%, making them far more deadly! Are you looking to score the winning goal with Star Striker? Make sure to participate in LoA2’s Pyramids of Destiny event from August 19th to August 21st for your chance to sign this star player over to your squad! Play League of Angels II now and check out all the fantastic new customization features like Battle Pets and Hero Skins! Last：Mythic Heroes Get a Brand New Look!